This section shows a table including the number of established and pending connections found for every LSLB farm. The number of connections shown are about the current stats in a certain instant. NAME. Name of the virtual service or farm related. Profile. Nature or type of load balancing used in this LSLB farm. VIRTUAL IP. IP address used by the virtual service to handle requests. VIRTUAL PORT. 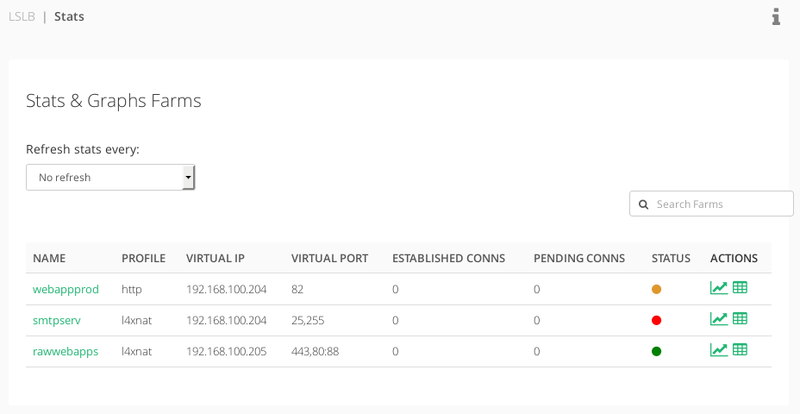 Ports used by the virtual service to wait for requests. ESTABLISHED CONNS. Connections marked as ESTABLISHED. For L4xNAT profile farms this means connected to a backend. For HTTP profiled farms this means connected to the virtual server. PENDING CONNS. Connections marked as SYN. An increasing value means a higher rate of requests received that can’t be served. STATUS. This shows the state of the farm system process with a green dot if the farm is up or a red dot if the farm is down. ACTIONS. This column has two links for every farm, a link to Show graphs and a link to Show backend stats. By default the statistics will show a single sample of the connections found for LSLB farms, but it is also possible to refresh the data every 10, 30, 60 and 120 seconds. Next step, see the farms graphs.